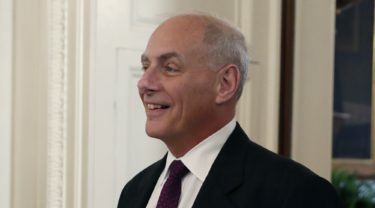 Raised voices could be heard through the thick door to the Oval Office as John Kelly, then Secretary of Homeland Security, offered some tough talk to President Donald Trump. Kelly, a whip-cracking retired general who was sworn in as White House Chief of Staff on Monday, had demanded to speak to the president alone after Trump complained loudly that the U.S. was admitting travelers from countries he viewed as high risk. Kelly first tried to explain to Trump that the admissions were standard , some people had legitimate reasons to visit the country , but the president insisted that it was making him look bad, according to an administration official familiar with the exchange about a month ago. Kelly then demanded that other advisers leave the room so he could speak to the president frankly. Trump refused at first, but agreed when Kelly insisted. It was an early indication that Kelly, a decorated retired Marine general who served three tours in Iraq, is not afraid to stand up to his commander-in-chief. Tapped to bring order to a chaotic West Wing, Kelly began to make his mark immediately Monday, ousting newly appointed communications director Anthony Scaramucci and revising a dysfunctional command structure that has bred warring factions. From now on, said White House press secretary Sarah Huckabee Sanders, all senior staffers, including the president’s son-in-law Jared Kushner and chief strategist Steve Bannon, will report to Kelly instead of the president. Sanders said Tuesday that Kelly had spent his first day on the job speaking with members of Congress, getting to know White House staffers and working to put new procedures in place. Kelly drew praise from lawmakers of both parties Tuesday.